Ragtime: The Musical tells the story of three families at the turn of the 20th Century in pursuit of the American dream. The award-winning score uses ragtime rhythms to paint a portrait of the people who built this country with the hopes for a brighter tomorrow. 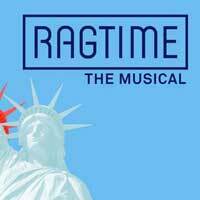 "..."Ragtime: The Musical," based on E.L. Doctorow's sweeping historical novel, swings for the narrative fences. The saga of three sets of characters at the turn of what would come to be known as "the American century," the show freely mixes the fictional with the factual in a theatrical montage that conscripts such famous figures as Harry Houdini, Booker T. Washington and J.P. Morgan to occasionally assist in pushing along the fabricated plot." "...The monumental job of making the music soar goes to music director and conductor Darryl Archibald. Even though the Playhouse's stage has been known to swallow the sound (and it does so occasionally in this production), the music still takes flight and delivers its emotional punch when it counts." "...A nation where the rich get richer, the poor get poorer, and immigrants are told to get out and stay out. Ragtime may take place a century ago, but the epic 1998 Broadway musical has never been more relevant than it is today, and thanks to director David Lee and a glorious cast and design team, its 2019 Pasadena Playhouse revival blows the seven other Ragtimes this reviewer has seen out of the water, and then some." "...Yet as well-served as the cast is by the score, they're shortchanged by Terence McNally's book. Perhaps it's due to the difficulties of adapting a 330-page novel into 150 minutes of stage action, but the second act feels overly melodramatic, with multiple characters taking broad actions without textual justification. There's an idea set up in the first act about the character of Little Boy (Luke Barbato Smith) that never pays off, which is unsatisfying." "...This is the show that every other on the L.A. scene this year will be judged by. See it for yourself, for bragging rights, or just to soak up the magic that artists at the top of their games can gift. The large 21-member cast is a gamble these days that most playhouses don't have the means to take. Pasadena's bet has already paid off with a perfect night worth gushing about." "...The important themes of the America of the 1900s continue to be just as important today - classism, racism, and immigration, for example. RAGTIME: THE MUSICAL touches on them all, showing us how far we've come and how far we've still to go, but it does it with music that elevates the spirit and sends you home feeling hopeful. Welcome hope into your heart, and go see this show!"